Other Products by Dedicated Nutrition. Search other BCAAs products. Dedicated Nutrition BCAA Sensation not only contains the muscle-building and recovery triggering amino acids but also combines an impressive line-up of ingredients to enhance your workout performance. The most important BCAA, Leucine is necessary to turn on "muscle growth mode" it is essential to protein synthesis and thus lean muscle growth. Along with Isoleucine and valine, these important amino acids trigger recovery and protect muscle tissue from catabolism. BCAA Sensation delivers citrulline malate which aids workout performance in a multitude of ways including vasodilation, which produces increased bloodflow to muscles and produces a great muscle pump, enhances oxygen uptake and improves muscular endurance. With the additon of taurine, Epo-Drol and Super Grape, Dedication Nutrition BCAA increases muscle force contraction, increases cell hydration, improves mental performance and mood, speeds recovery and gives a longer-lasting muscle pump. On top of these great perforamnce enhancing qualities you achieve cell hydration to maintain muscle perfornace and workout intensity. 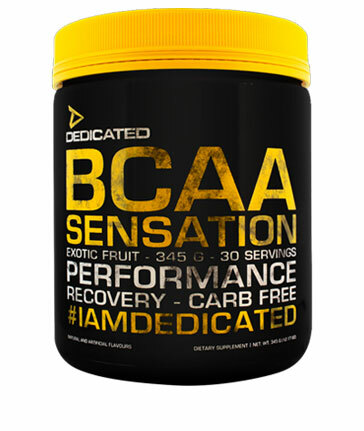 Dedicated Nutrition BCAA Sensation provides the ultimate Intra-Workout supplement to complement all aspects of training and sports activities. Mix 1-2 scoops of BCAA Sensation with 200-500ml of water and drink before and during training. An additional serve may be taken to assist with lean muscle gains and muscle recovery.